Harold R. Bruno III | Robinson Waters & O’Dorisio, P.C. At Robinson, Waters & O’Dorisio, Hal specializes in franchise and intellectual property litigation and arbitration. He also has a wide range of experience in trademark registration and commercial litigation. He received his undergraduate degree in finance from the University of Illinois and his law degree from the University of Colorado. Hal is admitted to practice law in Colorado and the District of Columbia as well as the United States Courts of Appeals for the 1st, 4th, 9th, 10th and Federal Circuits. Hal is listed in Best Lawyers in America® for Franchise Law and was selected as the 2016 and 2018 “Lawyer of the Year” for Franchise Law in Denver. He has also been recognized by 5280 Magazine as a Colorado Super Lawyer® in both franchise law and intellectual property litigation and has earned an AV rating from his peers through Martindale-Hubbell. Furthermore, he is an approved arbitrator with the American Arbitration Association and FranArb, Incorporated. 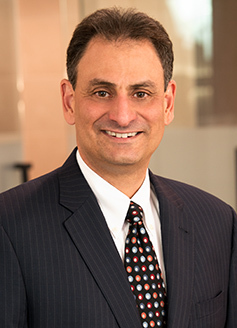 He is a member of the Litigation and Intellectual Property sections of the Colorado Bar Association and is also a member of the American Bar Association’s Intellectual Property Law Section and the ABA Forum Committee on Franchising. Hal was President of Temple Micah from 2007 to 2009 and volunteers for the Rocky Mountain Immigration Advocacy Network. James and Eby v. Taco John’s International, Inc., ___ P.3d. ___ (Wyo. 2018) – trial court summary judgment affirmed in favor of franchisor client on claims of two former executives for breach of employment contracts. The assertion by executives that there was apparent authority for their prohibited actions based on verbal assurances from the president of the company was defeated because the executives could not reasonably rely on such approval when their contracts required amendments to be in writing. Big O Tires, LLC v. C&S Tires, Inc., 2017 U.S. District, Lexis 79939 (D. Colo. 2017) – obtained back royalties, trademark infringement damages, attorney fees and costs against former franchisee. Midas International Corp. v. Poulah Investors, 2016 U.S. District, Lexis 117048 (D. Md. August 29, 2016) – obtained trademark infringement judgment against terminated franchisee as well as attorney fees and costs. Electrology Laboratories, Inc. v. Kunze, 169 F.Supp.3d 1119, 2016 WL 943778 (D. Colo. 2016) – obtained $625,000 trademark infringement, false advertising and misappropriation of trade secrets judgment plus award of attorney fees and costs for purchasers of a business against the seller. U2Logic, Inc. v. American Auto Shield, LLC, 2014 WL 4852094, *5 (D. Colo. 2014) – obtained partial summary judgment for copyright licensee in infringement case. Muirfield Homeowners Association, Inv. v. Summit Investments, Inc., Colorado Court of Appeals 12 CA 2396 (2014) – obtained reversal of $300,000 jury verdict on negligence claim based on economic loss rule. Cooper v. NCS Pearson, 733 F.3d. 1013 (10th Cir. 2013) – represented company president in claim against assignee-publisher for declaration regarding copyright ownership. In Re Potts, 2013 Bankr. Lexis 4164 (Bankr. Colo. 2013) – successfully defended secured creditors against claim by another creditor that debt of bankrupt was a gift. Holy Transfiguration Monastery v. Archbishop Gregory, 689 F.3d 29 (1st Cir. 2012) – defended Russian Orthodox monk against claims of copyright infringement. Big O Tires, LLC v. Felix Bros., Inc., 2010 WL 2757367 (D. Colo. 2010) – defeated defendants’ motion to dismiss based on California statute voiding mandatory forum selection clauses in franchise agreements. MRW, Inc. v. Big O Tires, LLC, 2009 WL 3368438 (E.D. Cal. 2009) – obtained summary judgment for franchisor on franchisee’s California unfair business-law practice claim. Big O Tires, LLC v. JDV, LLC, 2008 WL 4787619 (D. Colo. 2008) – enforced covenant not to compete for franchisor. Big O Tires, LLC v. Legacy Bank, ACB, 2008 WL 5095623 (W.D. Okla. 2008) – defeated motion to dismiss trademark infringement claim filed by purchaser of former franchised location. Halle Properties, LLC v. Bassett and Big O Tires, Inc., 2007 WL 2344931 (C.D. Cal. 2007) – successfully defended franchisor against competitor’s claim of interference with contractual relations. Bassett Seamless Guttering, Inc. v. GutterGuard, LLC, 501 F. Supp. 738 (M.D.N.C. 2007) – obtained settlement for distributor in territorial dispute with manufacturer and other distributor. Rhino Linings USA, Inc. v. Rocky Mountain Rhino Lining, Inc., 62 P.3d 142 (Colo. 2003) – argued to the Colorado Supreme Court applicability of Colorado Consumer Protection Act to distributor relationship. Big O Tires, Inc. v. Bigfoot 4×4, Inc., 167 F.Supp. 2d 1216 (D. Colo. 2001) – obtained preliminary injunction for trademark owner against “monster truck” company attempting to expand its trade channel. Buttler v. Benson, 193 F.R.D. 664 (D. Colo. 2000) – successfully defended parents against son’s former business-law partner. I Can’t Believe it’s Yogurt v. Gunn, 1997 WL 599391 (D. Colo. 1997) – obtained permanent injunction for franchisor on franchisee’s post termination use of trademarks and trade dress. Enforced post termination covenant not to compete. Grease Monkey International, Inc. v. Ralco Lubrication Services, Inc., 24 F.Supp.2d 120 (D.Mass. 1998) – covenant not to compete and royalty litigation with ex-franchisee for franchisor. Mitel, Inc. v. Iqtel, Inc., 124 F.3d 1366 (10th Cir. 1997) – defeated copyright infringement claim of rival manufacturer based on functionality defense. Haluska v. RAF financial Corp., 875 F.Supp. 825 (N.D.Ga. 1994) – compelled arbitration for securities brokerage firm. Smith v. Denver Food Systems, Inc., 1994 WL 551561 (E.D. Pa. 1994) – defeated franchisee’s claims against franchisor brought by franchisee after previous arbitration. Guiness PLC v. Ward, 955 F.2d 875 (4th Cir. 1992) – litigation involving enforcement of judgment obtained in the United Kingdom. Shell Oil Co. v. Commercial Petroleum, 928 F. 2d 104 (4th Cir. 1991) – obtained trademark injunction for oil company against reseller of product outside authorized distribution system. NBC Subsidiary (KCNC-TV), Inc. v. Broadcast Information Services, Inc., 717 F. Supp. 1449 (D. Colo. 1988) – obtained summary judgment for alleged copyright infringer on author’s claim for statutory damages and attorney fees.